Peter McCann, seen here captaining Glenavon, is set to join Rathfriland Rangers. INPT36-625. Just a day after taking over the reigns at Rathfriland Rangers, new manager Paul Kirk has announced four new recruits. Kirk, who left Lisburn Rangers to join at Iveagh Park, told the Leader that he has brought four of his squad with him. They are ex Portadown and Distillery winger Peter McCann, former Scottish Premier League midfielder David Graham and Amateur League regional team players Gareth Ringland and Daryl Evans. Also mulling over a move to Rathfriland is ex Glenavon forward Nathan McConnell. McCann was Kirk’s captain at both Lisburn Distillery and Lisburn Rangers, having previously won the Irish Premier League with Portadown. 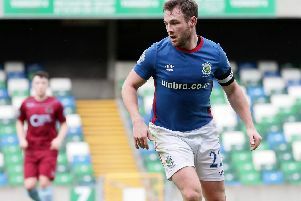 McCann also spent time in the top tier of Northern Irish football with Donegal Celtic, Newry and Glenavon. Graham, from Stirling, had a long career in Scotland, playing most notably in the SPL for both Hamilton and Dunfermline. He moved to Northern Ireland in 2013 and, after a trial with Crusaders, joined Lisburn Rangers. Make sure you see this week’s Leader sport as the new boss discusses his club’s ambitious plans.